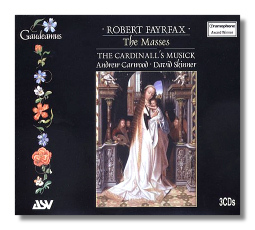 AS&V have brought together their previous issues of Fayrfax's masses in a 3CD compilation that is surely economical, especially that it is now whittled down to three well-filled discs. Those who are familiar with Tallis, Weelkes and Blow know what to expect and Fayrfax is definitely not a composer to overlook. 'Missa O Quam Glorifica' heralds the set with almost forty-five minutes of glorious polyphonic counterpoint. 'Missa Tecum Principum' is perhaps on a less exalted stage but includes a beautiful Agnus Dei that contains some ethereal closing moments too. Missa Albanus is altogether on a grander scale and also includes some parts for six voice and eight voice choir, summarily executed with conviction by The Cardinall's Music. 'Missa O Bone Ihesu' is a shorter work but also has a central section filled with very striking effects. There is also a short motet thrown in for good measure whilst the concluding mass is titled, 'Missa Regali Ex Progenie', a suitably fitting conclusion to the set with its fantastic scoring that is truly a gem of Renaissance architecture. The booklet also includes some intriguing facsimile reproductions and Skinner and Carwood are knowledgeable interpreters of the music, ably served by The Cardinall's Music. The individual discs won a Gramophone award so this new issue should be sampled without delay before it disappears!